3- Whence Comes the Power? KI-Media loves to hear from you, and we're giving you a bullhorn. We just ask that you keep things civil. Please leave out personal attacks, do not use profanity, ethnic or racial slurs, or take shots at anyone's sexual orientation or religion. We thank you for your cooperation! Three men were arrested in connection with the death of a chief abbott found dead in his room in Kampong Speu’s Phnom Sruoch district, military and provincial police said yesterday. 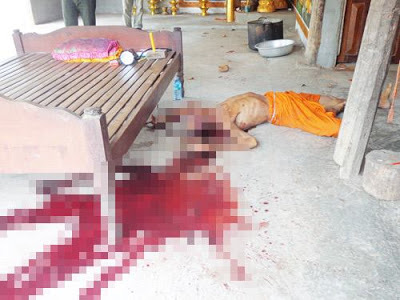 San Seng, 61, was found dead in Preah Puthmeanserie Pagoda yesterday morning but is believed to have been murdered around 11pm on Tuesday, according to Som Dara, a provincial police chief. “I believe the suspects killed him around 11pm while he was praying, because there was a book and a lit candle near the body and he had just returned from a funeral,” Dara said. Police arrested a monk affiliated with the pagoda and a father and son who live neaby. Why kill him? He is an old man already! Whoever did it will never get out of hell!